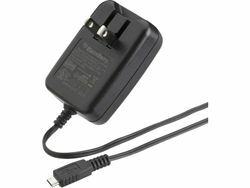 RIM's Blackberry original wall/travel charger (ASY-18078-001) recharges phone battery without overcharging. Folding blades make it a convenient traveler. Use it at home, at the office, or take it when you travel.